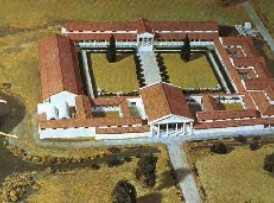 Some villas were virtual palaces in their size and complexity. In 1960, a workman was laying a new water main at Fishbourne in Sussex when he unearthed some pottery. Realising he may have found something significant, he reported the find to his superiors. In turn, they contacted the British Museum and an archaeological team began excavating the site. As they dug, a building began to surface. The more they uncovered, the more they realised this was a huge building. Eventually, they brought the remains of Fishbourne Palace to the surface. This was the biggest single building ever found in Britain, covering an area the size of Buckingham Palace in London. This was no ordinary home, it had been built around 80-90AD by someone who was obviously a person of authority. But who did this belong to? After many years of research it is generally agreed the owner was King Cogidubnus of the Regni tribe. He was a firm supporter of the Romans and aided them in their conquest of Britain. He was the successor to Verica, who was at war with the Catuvellauni before the Roman invasion. It was Verica who approached the Roman emperor with a plea for assistance to fight off the scourge of the Catuvellauni as they were steadily taking over the whole of South-East England. When the Romans did invade in 43AD. the Regni gave help to the Roman military by allowing them to use Chichester harbour as a landing stage for their campaign in Britain. He also aided them and sided with the Romans during the Boudiccan rebellion. So it is easy to see why the Romans would have rewarded the Regni king for his co-operation. The first thing a visitor to the palace saw on entering through the east entrance was a garden leading to the reception hall at the west end of the building. They had to walk the length of this garden to the doorway, and so passed the many splendours on the way. This garden had flower beds laid out in a stunning fashion. Fountains placed at aesthetic locations beside the gravel paths were fed by lead pipes carrying water from a spring outside the grounds. The entrance hall was reached by ascending a flight of stone steps and entering through a 40ft (12m) high porch graced by four carved columns. Inside was the audience chamber where guests were received upon a floor made of an intricate mosaic depicting scenes from Roman history that spread from wall to wall. The ceiling was painted in red, purple and blue. Around this chamber were exquisitely furnished suites for guests. 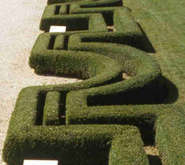 From the entrance hall, they went into another garden which had a 30ft (9m) wide path with shrubs along each side. In between the shrubs were recesses with more fountains built of Purbeck stone and marble statues were situated. In the north wing were two courtyards flanked by more guest rooms. 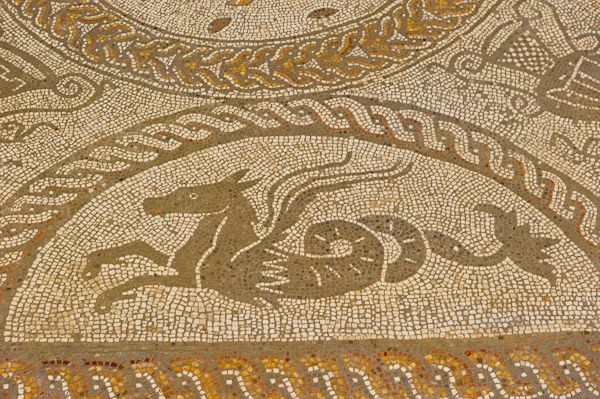 These had mosaic floors and were inlaid with marble from the far east of the Roman Empire. To the north-east was the great assembly hall which was 80ft (24m) long. Eight colossal piers divided the hall into aisles and supported the 100 ton plus (101,818kgs) roof. At the base of some of the columns were carved statues of classical Roman figures. In the east wing were two more courtyards with ten rooms. These were of a simpler design, not so elaborately furnished so indicating they were used for the helpers who accompanied the distinguished guests. The most stunning part of the palace was the south wing which was next to the bath house and was probably where the owner and his family lived. This part of the house was between two patios, one with a magnificent view of the gardens, the other looking towards Chichester harbour. Here the owner kept his boats and strolled amongst the glorious gardens. To build the palace must have been a monumental task considering the materials used and the distances these were transported. The excavation work for the foundations alone meant some 360,000 cubic ft (36,576 cubic metres) of soil had to be removed. There were 160 stone columns in the palace and 50 mosaic floors which were built by imported craftsmen. The materials along with the problems of design, organisation, and transportation, mean this was a task of epic proportions. From the design, it is clear a top architect was brought in from Rome to design the palace.